When most of us talk digital cameras, we talk megapixels, ISO, image noise, shot-per-second speed and image processing. We're tech geeks. But really, none of that stuff matters as much as your camera's lens. The lens is, after all, your camera's eyeball—the image sensor or film can only record what comes in through the lens. It's what defines the picture's perspective, clarity and way more. Lenses are actually a really complicated thing to talk about—if your job was to steer photons through tunnels of stretched glass, people would call you complicated too—so we're gonna try to keep it to field basics, you should know to get around, rather than dive into the crazy physics and mathematical ratios and stuff. Before we get into the basic lens types, you should know the two major numbers you're looking at you when you talk about lenses: Focal length and aperture. Focal length is the distance between the optical center of the lens and the point where it focuses the light coming into the lens (when a shot is in focus, that's the image sensor or film). The diagram above, from Cambridge In Colour shows, very simply, what focal length refers to, and how it affects your pitchas. Here's another pretty excellent, easy to understand explanation, with pictures showing the results of using different focal lengths on the same shot. Practically, what you need to know is that focal length measured in millimeters, and that's where you get, say, an 18-55mm lens, a 400mm telephoto or a 28-560mm lens found in a super-zoom camera. (You probably know this, but when you see "20x zoom lens," the spec refers to the ratio of the longest focal length to the shortest—so 560 divided by 28.) Basically, the longer the focal length, the more magnified or "zoomed in" your photo can be. Aperture is the other major spec on a lens, and something you deal with most on DSLRS. The aperture is the hole that actually lets the light into the camera, and you make can make it bigger or smaller. The size of the hole is expressed in terms of F-stops, or as you might see a lot F/2.8 or F2.8 or F8 or F11 or whatever. The bigger the F number, the smaller the aperture, or hole. The smaller the number, the bigger the hole, which means the more light it lets in. The reason that's good is that means you can shoot with a faster shutter speed, so you don't get blurry photos, or when you're shooting in low light, since more light can get through, which means you're not forced to choose between shooting dark, blurry things or excessively grainy photos as you crank up the ISO (light sensitivity) to compensate for the lack of light. So, when someone's talking about a "fast" lens, they're talking about one with a big aperture, like F/1.8—easy to remember, you can shoot with faster shutter speeds with less light. With a big aperture, you also have a shallower depth of field—subjects in focus are sharp, but everything around it is soft and blurry. A tighter aperture (higher F-stop number) lets you focus more at once, as you can see in the diagram above combined from Wikipedia. There's more on depth of field here. Overall, we're staying on the easy-to-swallow side, but if you've really got a hankering for F-stop knowledge, here's a crazy detailed explanation. Having fun yet? There are a few basic types of lenses, and of course, a whole bunch of specialized ones beyond that, like macro or tilt lenses. But here are the basics. A normal lens is one with a perspective that looks a lot the perspective of the human eye. With a 35mm or full-frame camera, that's about a 50mm lens, though it varies depending on the size of the film or image sensor. For instance, this 35mm Nikon lens is for their DX cameras, DX meaning it has a sensor that's not "full" (equal to 35mm film). When that lens is attached to a DX camera, it's the equivalent to a 50mm lens on a full-frame camera—making it normal. A prime lens is just one with a fixed focal length—you can't zoom in or out—and typically they produce sharper pictures than all-but-the-priciest zoom lenses. Any of the above lens types can be prime lenses, or zoom, below. This fisheye is a prime lens. A zoom lens is one you can adjust the focal length on—zoom in and out—so you can shoot a variety of stuff with a single lens. The aperture tends to vary based on the focal length, unless you get a really pricey zoom lens that's also "fast." But, even looking at one company at a time, lenses are complicated and sticky. Take Canon, for instance. They've got a million different kinds of lens mounts (where the camera and lens fit together) for their single-lens reflex cameras, depending on how far back in time you go. Currently they've got two major kinds of lens mounts: EF (electro-focus because the focusing motor action is built into the lens) and and EF-S. The latter is for their entry-level to mid-range DSLRs only, because it's made for their smaller (not full-frame, i.e., not 35mm equivalent) image sensors. Standard EF lenses will work on cameras with an EF-S mount, but EF-S lenses won't work on cameras with a regular EF mount. And before that, there was the FD mount, which totally doesn't work on DSLRs without an adapter. Nikon isn't quite as bad as here—they've had the same F-mount for over 40 years, so all their lenses with physically fit on the camera, but with their DSLRs, you've gotta watch out for their FX lenses (full-frame lenses like for the D700) vs. their DX lenses (like Canon, meant for their cameras with smaller APS-C sensors). When used on full-frame cameras, DX lenses will block out the corners of the picture since they're supposed to cover a smaller image area. But overall, with Nikon you have the advantage of being able to use older lenses in a way you can't with Canon gear. Ken Rockwell has a comprehensive tome about Nikon lenses and types for more. Okay, great. 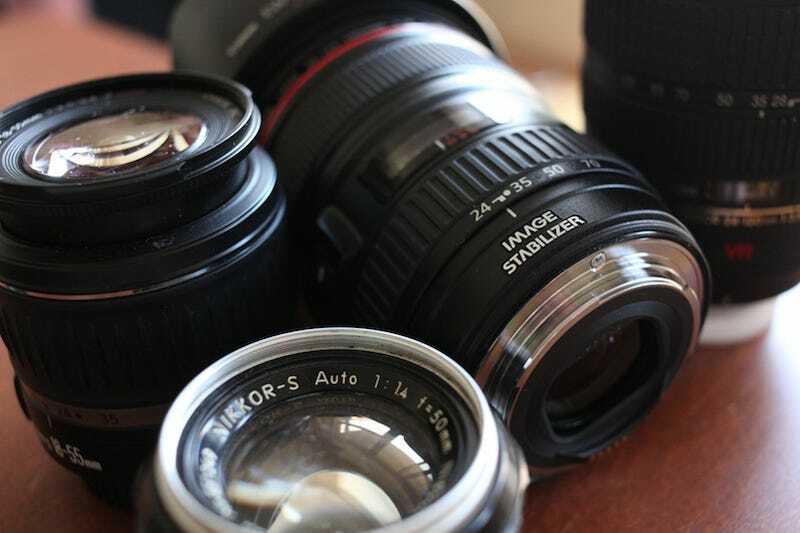 Here's a real question: Why are lenses so goddamned expensive? Well, as Steve Heiner, Nikon SLR-division technical marketing manager, told us, "You're paying for materials and the process of creating the lens," which, as you might guess, improves image quality. Faster apertures—which require larger glass elements in pro zoom lenses—heavier materials like metal, for durability, and touches like a nano-crystal coating that minimizes reflections for low-light shooting are things that make lenses cost hundreds or thousands or dollars. As a rep from Canon told us, there's no real getting cheaper over time, like most other mechanical components. Precision optical glass just doesn't work that way. At the same time, there is a lot of progress in lens tech happening—look at all the ultra wide-angle lenses popping up in point-and-shoots now. Canon says that's cause you've got smaller image sensors (which as we noted above, changes the relation of the focal length), more aspherical lens elements (which are cheaper to make), a new kind of ultra high refractive index aspherical optical glass (uhhhh, don't ask me) and the miniaturization of mechanical parts like AF motors. There's a lot we had to leave out, like chromatic aberration and lens flare, but we hope we gave you a pretty good starting point to learn about lenses. Real camera pros, feel free to leave more in the comments. Still something you still wanna know? Send any questions about lenses, upskirts, or crazy weird Japanese photographers who swarm cosplayers to tips@gizmodo.com, with "Giz Explains" in the subject line. Also, thanks to Nikon for the lens diagrams!